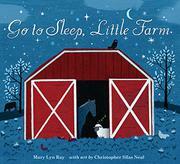 Ray and Neal tackle the tried-and-true theme of bedtime on the farm. Ray’s work does have some lovely turns of phrase; “Somewhere a pocket sleeps in a skirt” and a reference to “minutes that sleep inside clocks” are standouts. But as a girl is tucked into bed while the farm and natural world settle down around her, almost-rhymes and spotty rhythms undermine the text’s alternately lilting and halting efforts toward lullaby. Take the line “Somewhere a fox calls her pups to their den—as somewhere shadows tuck a house in.” It almost works, but not quite. Meanwhile, Neal’s mixed-media illustrations have a somewhat retro style and are appropriately dark and soothing, with soft visual textures and forms on each spread. Illustrations also strive to extend the text by resisting redundancy; for example, the line “Somewhere a bear” is accompanied by an illustration of a bear in the wild, but the page turn “finds a bed in a log” paired not with that same bear but a teddy bear and the girl burrowed under blankets. Perhaps a consistent continuation of this conceit, marrying nature scenes with parallel scenes in the girl’s home (à la the Dillons’ interpretation of Margaret Wise Brown’s Two Little Trains, 2001) would have succeeded.